Do you have a checkout funnel that is less than 60%? This means only 6 out of 10 people who start your checkout actually complete their purchase. If so then you probably want to tweak and test it but feel constrained by Shopify’s lack of access to checkout. 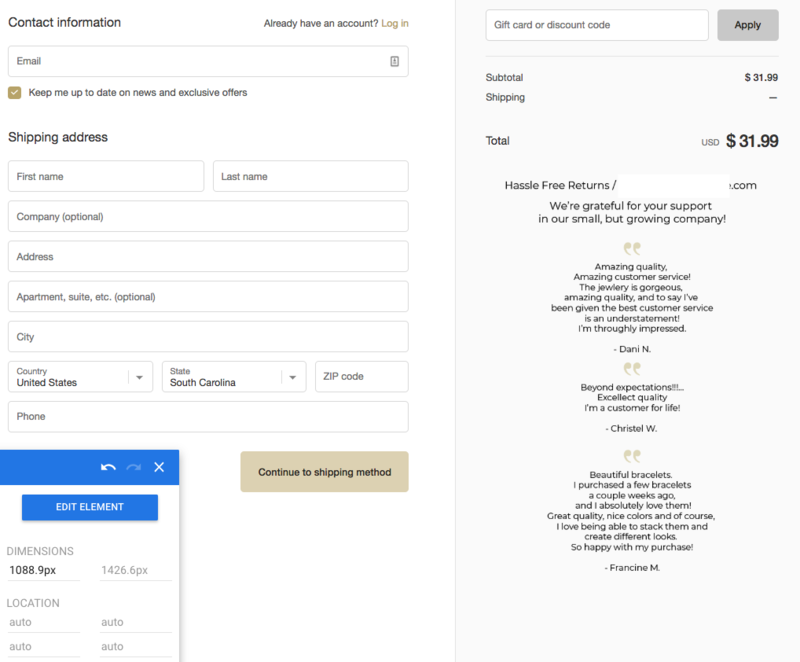 Luckily there is a way to a/b test the checkout for all Shopify stores using Google Optimize. 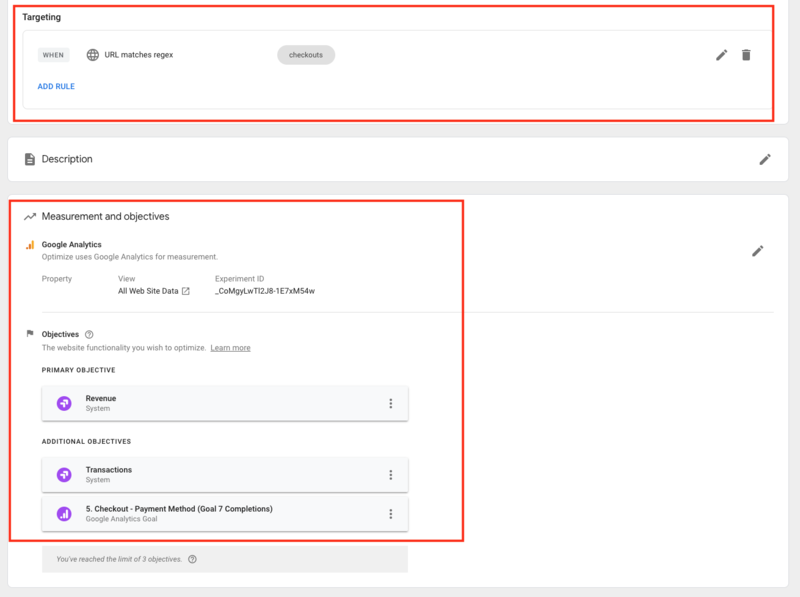 Before we start – do you have Google Optimize setup already? If not then read our how to guide on configuring Google Optimize for your Shopify store here. What separates you from competition? Do reviews from your existing customer base play a large role for new customers deciding to purchase? How critical is your shipping and return policies for customers? Do you receive a lot of press? 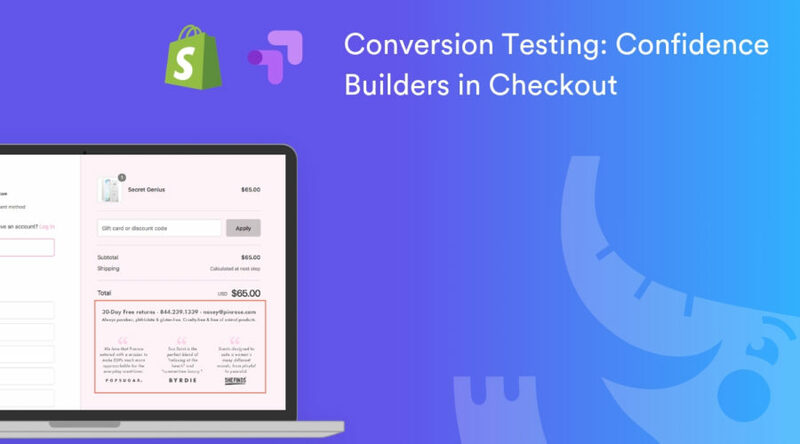 These are all questions you will want to ask yourself when creating your own confidence builder to include within checkout. Once you’ve decided on your confidence builder, it’s time to create! If you have a designer then they can put this together for you very quickly. Otherwise if you have to build yourself then consider a tool like Canva to create one yourself. Use a dimension size of ~ 1,000px wide by 500px high (or higher). Save your image as a transparent PNG file. In another browser window go to your website, add an item to your cart, and proceed to checkout. You can also choose to target this on desktop devices only if you don’t want to add additional content to the mobile site for this. You’ll also need to select your primary Google Analytics view and primary objectives (aka KPIs for this test). Both of these are shown in the image above. Set your primary objective to be Revenue. You can then add secondary objectives such as transactions or other micro goals (like this example shown of user reaching payment step). First we have to upload the confidence builder image to Shopify so we can use an image URL. Head over to Shopify Admin > Settings > Media Files > and upload your file. Now it’s time to implement the variation with your confidence builder image. 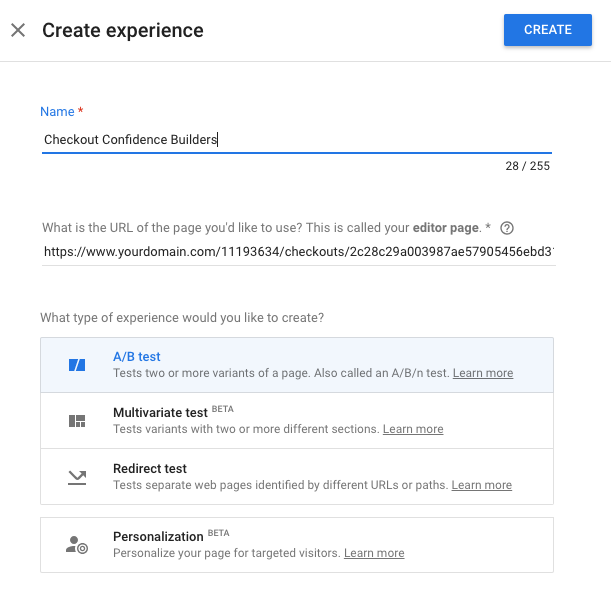 Inside of Google Optimize, create a new variant and click edit. 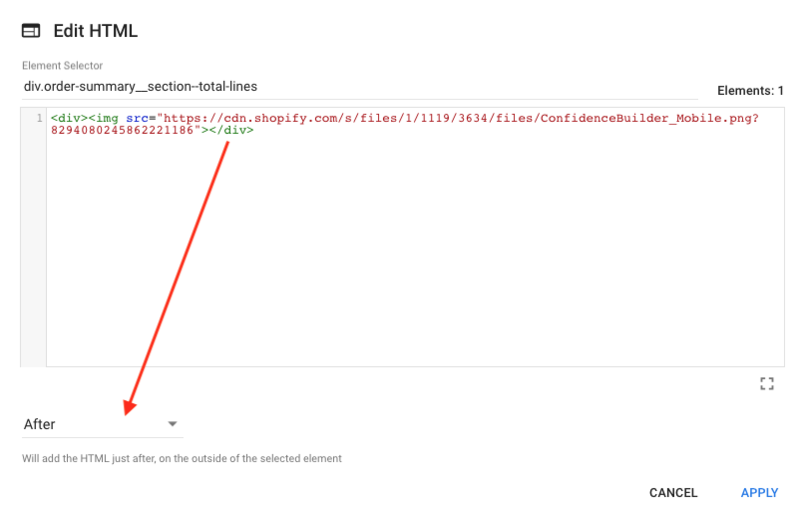 This will bring you to the Google Optimize editor screen where your checkout should be the page you see (if you set up step 3 properly). Once you have this selected then click on the editor icon in the top left of the page. From here you will want to click the HTML option in the dropdown. We’re going to add new HTML AFTER the subtotal block. You can use this and simply change out the image src which is the file name from your Shopify media files (this image URL won’t work ^). Now save this variant (you should only have one change) and then use the preview options within Google Optimize to confirm everything displays properly. 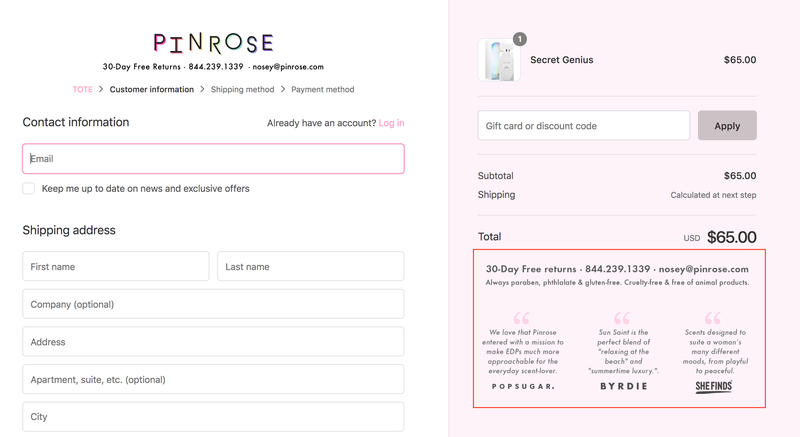 Try testing different qty and products added to cart and confirm these are accurate all the way through the checkout process (before payment) when you are within the variation. Once you feel confident everything is ready to go then double check all of your settings and publish your test!